Version 2.1.0 was a major revision to Splatoon, which took place on 2 September 2015 at 02:00 UTC. If both team's counts (goal distances) are extremely close, in spite of differences between the counts, the on-screen display denoting the counts/numbers would show the same numbers. This has been fixed. After advancing the Tower to the same count, the opposing team was unable to take the lead where the tower was then taken. This was changed to behave as it did to before Version 1.3.0 (referring to this situation). In Version 2.0.0 it was "the team that takes the lead has their count decreased by 1," while before Version 1.3.0 it was "the team who had the lead taken from them has their count increased by 1." Adjusted terrain in the wall leading up into a team's base in the side alleys so that squids can no longer climb it through an exploit. (Fixes this glitch). Terrain adjustments to prevent players from directly jumping to the opponent's side on Turf War and Splat Zones. Not applicable for Tower Control as the layout already has bars. While moving, the movement of the field of view when raising the roller overhead has been fixed. The problem was caused in Version 2.0.0 and has been corrected back to the same movement as in Version 1.3.0. In the situation a bomb hits an opposing team's Splash Wall, players on the other side of the wall would receive damage. This has been corrected. Receiving Error 104-2230 after downloading the Version 2.0.0 update was fixed. The announced gear was already added in 2.0.0. 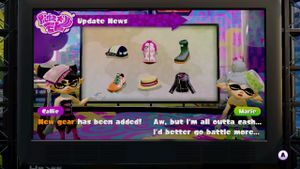 On the Inkopolis News segment announcing this update, Callie and Marie announced new gear, when no new gear was released. This page was last edited on 15 December 2018, at 21:20.